Targus Tablet Flip Case Étui Housse Rouge universel 7-8"
Eine schlanke und leichte Tablet-Hülle mit Rundum-Schutz. Perfekt für die Bedienung mit einer Hand, lässt sich einfach in einen Ständer verwandeln. Strapazierfähige Außenseite und weiches Innenfutter schützen Ihr Tablet gegen Kratzer. Wir finden eine Lösung! Schutz für das Samsung Tab A mit persönlicher Note. „Fairness im Handel“. Mitglied der Initiative. 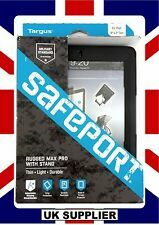 NEW Targus SafePort Rugged Max Pro Case w/ Stand / Handle for iPad 2 3 4. NEW Targus SafePort Rugged Max Pro Case w/ Stand / Handle for iPad 2 3 4. This is Tough Military Standard case. Best protection money could buy. Accès à tous les ports et fonctions de votre iPad Mini sans le sortir de l'étui. Compatible toute tablette 7-8". ON/OFF automatique. Ergonomie: Reglage de l'angle de vision et de frappe confortable. Une housse au parfait maintien, conçue pour compléter votre iPad. NOUVEAU! Targus THZ743GL Pro-tek Coque Pour Apple 11"
Pro-Tek case for Apple 11". Available in range of colours to match iPad hardware. Wipe clean, water-resistant cover with a microfiber lining transforms into a stand for comfortable viewing and typing angles. so protect. Targus Fit n Grip Rotating Tablet Case Cover Housse De Protection Tablette Universel 7-8"
Audio-Wiedergabe für iPad-Lautsprecher Abwischbare, wasserabweisende Abdeckung mit samtähnlichem Mikrofaser-Futter. Smart-Fit-Hülle für 9.7" iPad Pro Air 2 & 1 mit Rundumschutz. Wir finden eine Lösung! Targus pro-tek Ipad Case. Dispatched with Royal Mail 1st Class. 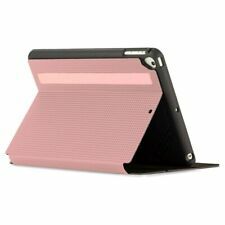 Targus Vuscape Cover pour tablette Housse de protection housse case Google Nexus 7,0"
Farbe: Schwarz. Wir finden eine Lösung! „Fairness im Handel“. Mitglied der Initiative. Targus Case Housse Cover Étui de Protection Housse Samsung Galaxy Tab A 9,7"
Targus Tablet folio rotating case Étui Housse Noir universel 9,7-10,1"
Eine Tablet-Hülle aus Kunstleder, die Rundum-Schutz bietet und über eine Schwenkfunktion von 360° verfügt. Der drehbare Ständer ermöglicht eine stabile Anzeige im Hoch- oder Querformat in verschiedenen Neigungswinkeln, ohne die Hände zu benutzen. This is a very nice Targus Fitcase for the Linx 1010. It has a magnetic closure which might even be smart, if I recall. 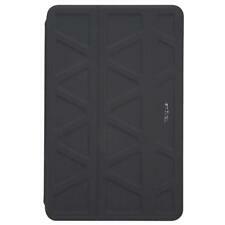 Targus Etui de protection Tablette 8" pour Galaxy Note THZ207EU. réf: THZ207EU. Targus SafePORT All Round Protective Case for iPad Mini. Protect your expensive iPad mini from harsh incidents without the "bulkiness" of a rugged case. Its even lighter than its rubber counterparts whilst maintaining its duty of protection. Targus EverVu CASE BookCover housse cover Samsung Galaxy Tab 4 7,0"
Leichte, perfekt sitzende Hülle. Weichen Innenfutter zum Schutz des Displays. Bietet zahlreiche Neigungswinkel zum Anzeigen. Wir finden eine Lösung! Robuste und weiche Abdeckung. Zugriff auf alle Anschlüsse, Features und Funktionen. Tech Data Product Data Sheet - Targus SafePORT(THD135GLZ). For added versatility,the case includes an integrated sliding stand for landscape viewing and typing positions as well as an optional,detachable hand strap and shoulder strap. Elegante, sottile e professionale, Targus. .
L'étui rotatif Pro-Tek pour Samsung Galaxy Tab S4 10.5 "(2018) offre une protection pratique et une belle apparence adaptable grâce au design géométrique Pro-Tek de Targus. Des pare-chocs robustes renforcent la protection des impacts. La fermeture enveloppante magnétique sécurise et protège en tout temps. Et, comme les autres valises Targus, elle offre une protection de niveau militaire pour les chutes allant jusqu'à 4 pieds. L'adaptabilité semblable à celle d'un caméléon vous permet de vous adapter facilement flip transforme votre étui en support robuste pour une frappe confortable.Regardez à nouveau pour une visualisation facile, avec une rotation en douceur du positionnement portrait à paysage. Gardez votre entreprise votre entreprise avec un écran de confidentialité Targus. Nos écrans de confidentialité peuvent être utilisés sur la plupart des périphériques et ne permettent que la visualisation normale des données à l'écran directement devant. Ils agissent également en tant que protecteur d'écran. L'écran de confidentialité est double face pour assurer la clarté et éviter la fatigue oculaire, où que vous soyez, ébloui ou non. Un revêtement antimicrobien inhibe la croissance des bactéries, ce qui le rend idéal pour une utilisation avec les écrans tactiles. Targus VersaVu Case for 12.9" iPad Pro - Black. Patented stand design rotates your iPad Pro for handsfree viewing, browsing and typing in portrait or landscape. Military Standard protection to keep your iPad safe no matter where you go. Targus THZ744GL Versavu Classic Case for 11-In. Ipad Pro Black Flip Cover f. The VersaVu Classic Case for 11-in. iPad Pro combines leading protection,efficient functionality,and versatile viewing. Targus VersaVu Classic Case for 11-in. Reinforced ribbed tray for anti-shock protection. Perfect fit tray with easy access to all ports and buttons. Dirt and water-repellent exterior coating for easy cleaning. Advanced engineering with high performance materials for superior protection. Slim hard case with stand designed to securely hold and protect your iPad mini. Élégant, mince et professionnellement, Targus. --- Unique, patent pending stand design that allows iPad to rotate so the screen can be viewed in portrait or landscape --- 4 viewing angles plus 1 typing position makes this case versatile --- A wipe-clean outer case and soft-touch inner lining --- Durable, water resistant padded exterior shell --- Clever stylus storage --- Dimensions (LxWxH): 350 x 205 x 450 cm --- A Better View at Every Turn The Versavu Case is more than a cover for your iPad – it’s a stylish and functional way to store and protect what’s inside. Surfing the web in landscape mode or reading the latest news in portrait? Quickly switch between both viewing styles without any hassle. The case features patent pending 360° rotating technology, making it easy to view the iPad vertically (portrait) or horizontally (landscape). Soft line Protection Against Straches. Manufacturer Part Number: THZ675GL. Product Model: THZ675GL. Manufacturer: Targus Group International. Application/Usage: iPad Pro. Compatibility: Apple - iPad Pro. Product Type: Carrying Case. Colour: Black. Targus EverVu Case Housse De Protection Tablette Housse BookCover Samsung Galaxy Tab A 9,7"
Wir finden eine Lösung! Schutz für das Samsung Tab A mit persönlicher Note. „Fairness im Handel“. Mitglied der Initiative. Farbe: blue. NOUVEAU! Targus THZ74502GL VersaVu signature case 11"